We're often asked about players that we should interview. Without exception, the one name that crops up time and again is John Deacon of Queen. In a reader's poll in 2017, Mr Deacon came eighth in our list of the Top 40 Greatest Bassists, while two of his best known basslines, Under Pressure and Another One Bites The Dust, could be found in our Top 40 Coolest Basslines Ever poll, at numbers seven and two respectively. The man is a huge bass influence and, although Queen's legend continues to grow, it's a shock when we realise that the musician who provided the group's (fat) bottom end hung up his bass strap 21 years ago. 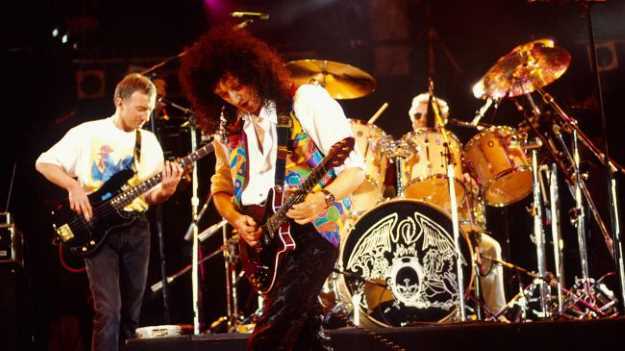 Following Queen singer Freddie Mercury's AIDS-related death in November 1991, Deacon struggled to come to terms with his loss - and despite occasional live and public appearances, and the posthumous final album, 1995's Made In Heaven, it continues to look as though the final curtain has been lowered on Queen's illustrious golden age. 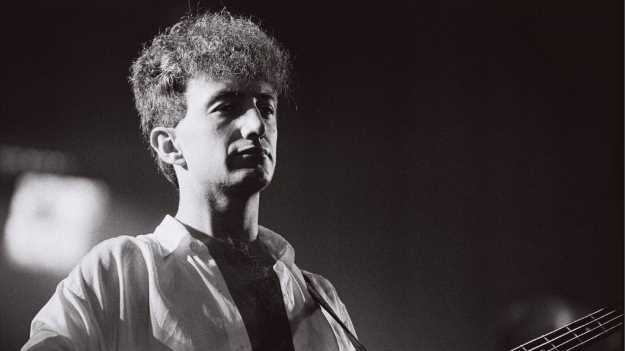 Born in Leicestershire in 1951, John Deacon began his career in 1965 as a guitar player for the Opposition, before switching to bass in 1966 when a new rhythm guitarist was recruited. He left the band in 1969 following his move to London. While studying electronics at Chelsea College, he auditioned for Mercury, May and Taylor in 1971 and was accepted into Queen, who had formed the previous year. The group subsequently signed to EMI in the UK and their debut album, a self-titled soon-to-be classic, appeared in '73. Deacon was portrayed as the 'quiet one' of the group, but in reality he was far from shy within its inner workings and was more than happy to fight his corner where decision-making was concerned. However, he didn't court the public eye and preferred the security of home life away from the cameras. Queen were unique in several ways. They were one of very few bands who would take on any musical genre; all of their individual members contributed as songwriters and lyricists; and they produced hit singles that sent radio stations into meltdown and left record stores unable to keep up with demand. With Mercury and May dominating much of the songwriting in the early years - Misfire from 1974's Sheer Heart Attack aside - it wasn't until A Night At The Opera (1975) that he delivered a chart smash in the form of You're My Best Friend, a song that remains a radio staple the world over. Deacon cemented his songwriting ability with a 24-carat, solid gold hit in the form of Another One Bites The Dust from The Game in 1980. The song was never meant to be a single, but some gentle nudging from Michael Jackson and airplay on black radio stations in the US sent the song rocketing to the top of the charts, sealing Queen's reputation in the US. It's ironic, then, that the video for another Deacon track, I Want To Break Free, relegated Queen to the American sidelines from 1984 onwards as a result of audiences there failing to appreciate its cross-dressing humour. From 1989's The Miracle through to Made In Heaven six years later, the band decided to share the songwriting credits equally, so it isn't clear who contributed which song ideas, but the band worked more solidly as a unit than it had ever done in the light of Mercury's HIV diagnosis. The fact that in 2018 the band are still riding high and touring the world with Adam Lambert on vocals is a clear indication of how integral those classic songs remain, all these years later. Let's turn to Deacon's bass gear, about which rumours have always abounded - some of which we're glad to clarify. His first bass was a second-hand Broadway Solid, followed by an EKO purchased for Â£60 from a music shop in Leicester - but by the time he joined Queen in 1971, his weapon of choice was a sunburst Fender Precision. Early photos and clips exist of John with black and jetglo Rickenbacker 4001s, as well as natural and sunburst Fender Jazz basses. Neither of the latter lasted long, as they weren't used or seen again. The sunburst Precision remained in favour up until the A Night At The Opera period, when Deacon was seen with a pair of natural-finish P-Basses. Following the launch of the Stingray bass by Music Man in 1976, Deacon adopted one for Queen shows, and the following year the new active circuitry pushed his melodic lines to the fore. In the same period, he used several other basses both for recording and on the road. These included a 1950s Precision with a single-coil pickup, and a second sunburst Precision with a fretless maple fingerboard that appeared on tracks such as Dreamer's Ball and My Melancholy Blues. In the 80s, as Fender started to dabble with active electronics and expand their portfolio, Deacon's new basses included a grey/pewter Precision Special with a matching headstock, and a red Precision Elite I with white Elite model pickups, as seen in the One Vision, I Want It All and Headlong videos. A Kramer Custom DMZ4001 could be seen in the Play The Game video, while a natural Warwick Buzzard appeared for the Friends Will Be Friends clip and Montreux '86 appearance. A rare appearance with an upright bass took place at the Who Wants To Live Forever shoot; he also used one to record '39 on A Night At The Opera. He was also seen sporting a Wal Pro Mark 1 at a jam session in 1982 or '83 - although it's unclear if he actually owned the bass - and for the Magic Tour of 1986, Deacon's Precision was now a sporty-looking black model with gold hardware. From 1986 onwards, John commissioned a custom bass from the British luthier Roger Giffin, along the lines of his Precision but with a natural walnut top and a P/J pickup configuration. However, this is where we earn our stripes as investigative bass journalists... following confirmation from Deacon and Mercury's tech Peter Hince, we can confirm that the sunburst fretted Precision, one of the natural Precisions and the black model were in fact the same bass, simply given a makeover when John decided to do so. The royalties may have rolled in, but our man was obviously happy with his tone! 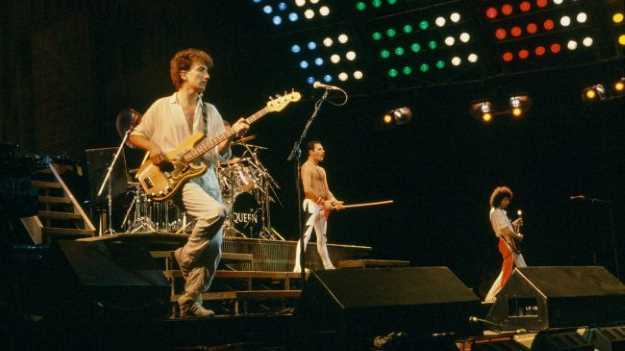 You may have seen a clip on YouTube of Queen's final show with Mercury at Knebworth in August 1986; as the final chords of We Are The Champions die out, Deacon takes off his bass and throws it at his amplification. Was this sheer exuberance or a delayed reaction to the singer's recent announcement that he "might not be terribly well", and "can't do this any more"? We can't say. As it turned out, Mercury was right. In amp terms, Deacon's requirements changed over the years. He began his career with an HH Electronics IC 100-watt amp, an Orange OR120 head and an Orange 4x12 cabinet, but this was superseded by three Acoustic 370/371 amps driving three Acoustic 301 reflex cabinets, plus an extra HiWatt amp atop two Sound City 4x12 cabs. The latter speakers were eventually replaced with Peavey 4x12 cabs, with one stack placed on May's side of the stage. Deacon then moved onto Sunn amplification, followed by the HH rig for the tours through the 80s, while his final appearances, including the Freddie Mercury Tribute Concert at Wembley Stadium in 1992, saw him in front of SWR SM-900 heads and Goliath cabinets. When recording, he would usually DI the bass but also mic up an Acoustic 301 cabinet and a 4x12 cabinet, the final signal being a combination of all three - making for a rich, thick tone. Deacon's background in electronics led to him providing May with the 'Deacy Amp', a piece of equipment responsible for several of the guitarist's classic tones. For the bulk of his career, John furnished his basses with Rotosound RS77 LD steel flatwounds (45-105 gauge) and the odd foam mute from time to time, although once Queen reached the 80s, the extra bite and crispness of roundwound strings was required. By 1985, he was using both string types, as confirmed in The Complete Works box set from 1985, which featured a copy of the band's touring carnet. By the late 80s, he had followed May in using Maxima gold strings. Deacon is predominantly a fingerstyle player, although he is adept with a pick when required. He rarely employs slap, although you can certainly hear the occasional thump and pop on record (Cool Cat) and live (Dragon Attack and Another One Bites The Dust). If you want more examples of his genius, the single No-One But You, his swansong with the band, and the lost track from the Forever compilation, Let Me In Your Heart Again, feature bass moments to cherish. If you take bass playing seriously, there is much to learn from John's output. 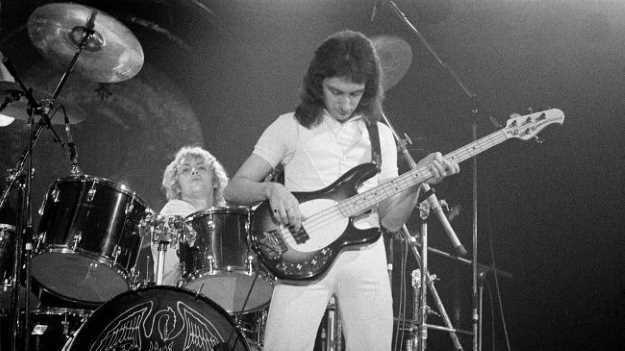 It seems unlikely that we'll ever see John Deacon grace a stage again, according to quotes from Doctors May and Taylor - but we would like to thank him and salute his contribution to the world of bass guitar. As you can see from the contributions of our esteemed friends above, his influence lingers. As Freddie Mercury sang: Who Wants To Live Forever? Well, we're pretty sure those basslines are immortal.